Gone are the fat-phobic days of the 90’s. And thankfully, that’s great news for your health! Healthy fats are an important part of our diets. Your body needs fat for energy, to protect your organs, keep your body warm, and support cell growth. Fats also help your body absorb nutrients like the fat-soluble vitamins A, D, E, and K, and produce important hormones. Eating healthy fats also help you feel full and satisfied after a meal, can lower blood pressure, and fight against heart disease, dementia, and some cancers. Let’s keep in mind that not all fats are created equal; fat from an avocado is certainly not the same as fat from a serving of fries. About 20 to 30 percent of our daily caloric intake should come from fats, and ideally we want to aim for healthy fats. But what makes for a healthy fat? Monounsaturated fatty acids and polyunsaturated fats, which are typically found in plant-based oils and foods, are known to help reduce blood cholesterol levels, which in turn lowers the risk of heart disease. These heart-healthy fats also slow the buildup of plaque in the blood vessels and reduce inflammation, as well as helping to manage insulin levels. Omega-3 fatty acids, such as those found in fatty fish, walnuts, and chia seeds not only help to lower the risk of heart disease, stroke, and cancer, but they’re also protective against memory loss and dementia. Omega-3’s are also essential for brain development, so they’re an important part of the diet during pregnancy. Although saturated fats are generally to be avoided or consumed less often, some saturated fats such as those found coconut oil and grass-fed butter are now thought to be heart healthy after all. 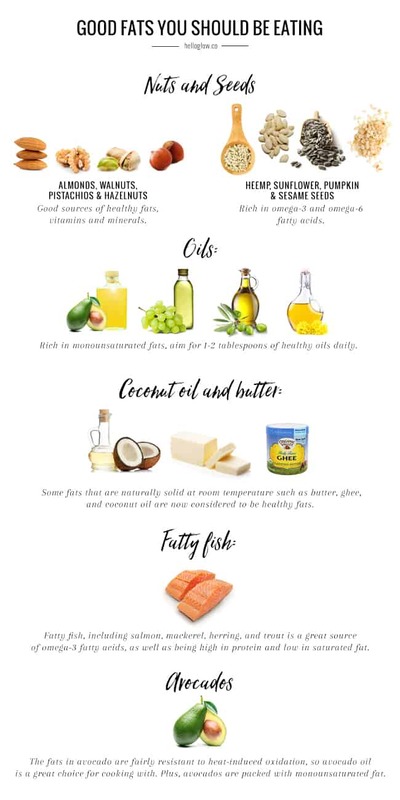 In general, to ensure you’re getting healthy fats in your diet, choose foods that provide monounsaturated and polyunsaturated fats. What are some foods that contain the healthy fats we should be eating? Almonds, walnuts, pistachios and hazelnuts are good sources of healthy fats. Go for a handful of unsalted nuts or a couple of tablespoons of nut butter a few times a week, and be sure to mix it up, as different nuts have different vitamin and mineral profiles that we benefit from. As far as seeds go, chia and flax are rich in heart-healthy omega-3 fatty acids, but we also benefit from the omega-6 rich hemp seeds, as well as sunflower and pumpkin seeds. Sesame seeds not only contain healthy fats but are also great source of calcium. Cold-pressed oils such as extra-virgin olive oil, canola oil, grapeseed oil, and avocado oil are rich in monounsaturated fats. Olive oil is great for cooking with, as are canola and avocado oils (check out our guide to healthy cooking oils) and others such as flaxseed and sesame are great for making homemade dressings. Aim for 1-2 tablespoons of healthy oils daily. Although you definitely want to avoid trans fats and hydrogenated oils, some fats that are naturally solid at room temperature such as butter, ghee, and coconut oil are now considered to be healthy fats. 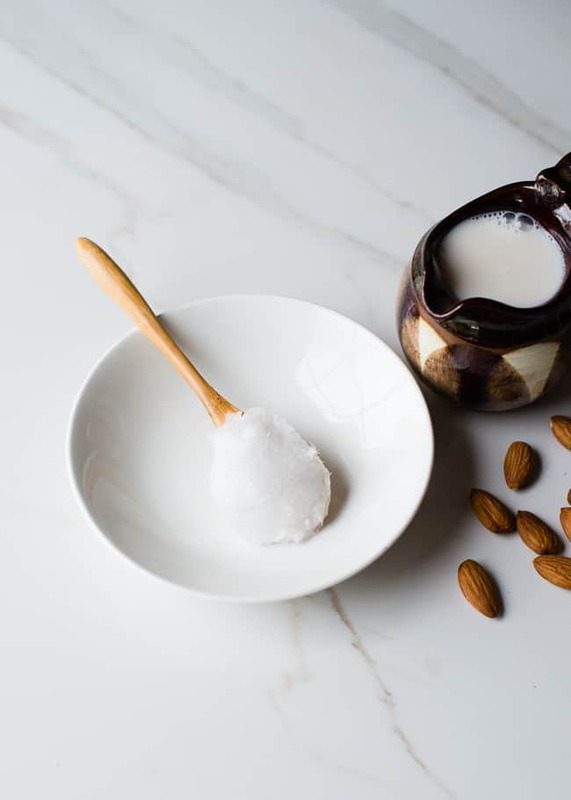 And while it’s true that these are high in saturated fats, which we generally want to consume less of, about half of the saturated fat in coconut oil is made up of medium-chain fatty acids called lauric acid, which have been shown to improve levels of HDL (good) cholesterol. Lauric acid is also digested more easily than other forms of fatty acid, which means it is more readily converted to energy as opposed to simply stored as fat. Fatty fish, including salmon, mackerel, herring, and trout is a great source of omega-3 fatty acids, as well as being high in protein and low in saturated fat. Current recommendations suggest at least two servings of fatty fish each week. For vegetarians and those who don’t eat fish, algae oil supplements are a good alternative source of omega-3’s. Avocados are packed with monounsaturated fat. In fact, nearly 80% of the calories in an avocado are from fat, the majority of which is oleic acid–the same heart-healthy fatty acid found in extra-virgin olive oil, which has been shown to reduce inflammation, among other benefits. And while a serving of avo toast is delicious and satiating, the fats in avocado are fairly resistant to heat-induced oxidation, so avocado oil is a great choice for cooking with. I really enjoyed the article. It’s full of great advice and I thankyou for that. However I was very surprised to see you recommending canola oil as a healthy fat. Perhaps do some extra research on canola, it’s rapeseed that has been messed with by scientists, canola doesn’t exist in nature. I would not recommend this fat if anything it should be avoided. your blog is such a great resource, thank you so much for sharing all of these tips! i eat a ton of nuts on a regular basis (and nut butter), but i think i need to start incorporating more healthy fish and coconut oil, as well! I miss being able to eat avocados. I have a mild latex allergy and something in avocados can mimic a latex allergic reaction in many people. It’s unfortunate because I love them. EVOO is a staple in my kitchen, though. Oh man, that’s such a bummer! Good to still have EVOO to turn to, though. Glad to say I eat all of them – especially fish!